In this article we will discuss a very high level view of the difference between bits and bytes. A bit is sort of like a computer's atoms. It is the smallest unit of measurement for data, and the most a computer can process at any given time (in Binary this is the 1 or 0 that makes up data). A byte is made up of eight bits. Because of it's larger size, byte is typically used in terms of memory (kilobyte, megabyte, gigabyte) and bits are typically used to measure the speed at which data can be transferred or processed (such as Internet speed, in kilobits, megabits, and gigabits). Now that we've got the definitions out of the way, let's talk about how this translates to how quickly you can download something off of the Internet. If you have a 1 MB (megabyte) file that you are downloading, and your Internet speed averages about 4 Mbps (megabits per second), then you can download that file in two (2) seconds. A gigabyte is made up of around 1028 megabytes, so if you have a 1 GB file, and your Internet speed averages about 4 Mbps, it will take you approximately 35 minutes and 47 seconds. We hope this helps put things in perspective! The video expains ideas to help improve connectivity on your wireless home network and reasons your signal and speeds may not be where they are supposed to be. AirNorth uses Wireless Point to Point technology to provide internet service to the rural parts of Cheboygan County that are otherwise either unserved or underserved by the major carriers such as Charter and AT&T. To be able to provide wireless internet service to the residents of Cheboygan County, the network begins with a fiber internet connection that feeds into our main tower (headend). From here we use powerful point to point equipment that we call backhauls to transport the wireless signal from tower to tower. The signal is received and sent down the tower to a router via Cat5 cable where it is then sent back up to either additional backhauls to be passed along to other towers OR to multipoint wireless equipment the broadcasts straight to individual customer homes. The location of each tower, and subsequent access point, is very important because we have to be able to maintain a clear line of site from point to point to be able to provide the best quality signal. The signal is then received by another piece of wireless equipment that is either mounted to the exterior of the home or to a structure such as a pole or a tower and the internet is brought into the home via Cat5 cable and plugged into a wireless router which broadcasts wireless internet throughout the home, based on the capabilities of the router. The equipment is so sensitive that when pointing the receiver, we have to move the equipment millimeters at a time up/down & side to side. Our business model is to provide internet service for the residents of Cheboygan County who are otherwise considered unserved or underserved by the major carriers. Charter, AT&T and other carriers have spent millions of dollars building infrastructure throughout the nation. They build out to the more populated communities because of the costs involved in the infrastructure build and the ROI. The rural communities are the ones who suffer because the population is not high enough to support the build costs. AT&T and the other major carriers were able to build telephone infrastructure into the rural communities over the past 60 years because of subsidies provided through the federal government agencies such as the USDA and the RUS. In recent years, the USDA and the RUS have restructured the way they subsidize for telecommunication infrastructure and no longer provides incentives for building to the rural communities. This is why companies like AirNorth are so important to communities such as Cheboygan and Indian River. We are able to go beyond where the major carriers infrastructure stops. And unlike satellite service, AirNorth does not have data caps thus eliminating the ridiculous overage fees. Chris Hoffman is a technology writer and all-around computer geek. He's as at home using the Linux terminal as he is digging into the Windows registry. Connect with him onGoogle+. Have you ever noticed that your Internet service provider advertises their speeds as “up to” a maximum speed? You may think you’re paying for a 15 Mbps connection, but you’re actually getting an “up to 15 Mbps” connection that may be slower. We’ll look at why actual speeds differ from advertised speeds and how you can identify whether you’re actually getting the Internet connection speeds you’re paying for. Data showing that most people are getting slower broadband speeds than they’re advertised is easy to find. To get this data, all someone has to do is run a speed test on their connection and compare the actual results to the advertised speeds. In most cases, the speeds are slower. 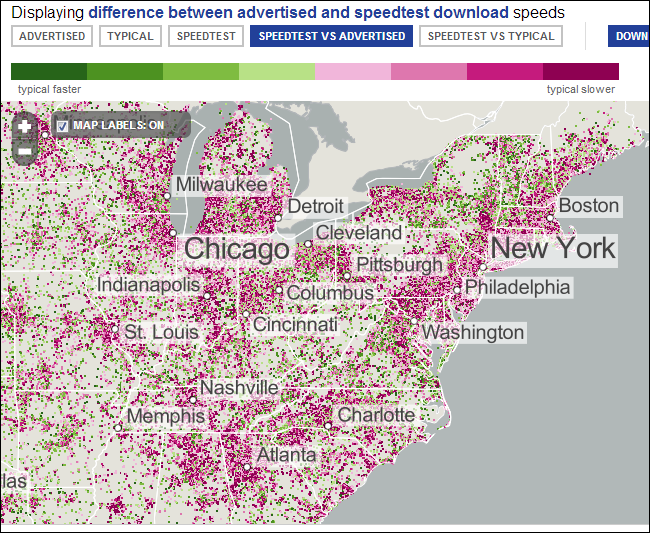 If you’re curious about Internet speeds in the US, you can view the official US government National Broadband Map site and compare “SpeedTest vs. Advertised” to view the difference between actual speed tests and advertised speeds on a map. All the purple and pink dots are slower than advertised, while the light green dots are areas which match their advertised speeds. The map appear to be primarily dark purple and pink — it’s clear that most people are getting slower speeds than they were advertised. Faster speeds than advertised, which are dark green, are even harder to find. End-User Hardware Issues: If you have an old router that just can’t keep up with modern speeds or a poorly configured Wi-Fi connection that’s being slowed down by interference, you won’t actually experience the connection speeds you’re paying for — and that’s not the Internet service provider’s fault. Distance From ISP: The further you are away from your Internet service provider’s hardware, the weaker your signal can become. If you’re in a city, you’re likely to have a faster connection than you would in the middle of the countryside. Congestion: You’re sharing an Internet connection line with many other customers from your Internet service provider, so congestion can result as all these people compete for the Internet connection. This is particularly true if all your neighbors are using BitTorrent 24/7 or using other demanding applications. Time of Day: Because more people are probably using the shared connection line during peak hours — around 6pm to midnight for residential connections — you may experience slower speeds at these times. Throttling: Your Internet service provider may slow down (or “throttle”) certain types of traffic, such as peer-to-peer traffic. Even if they advertise “unlimited” usage, they may slow down your connection for the rest of the month after you hit a certain amount of data downloaded. 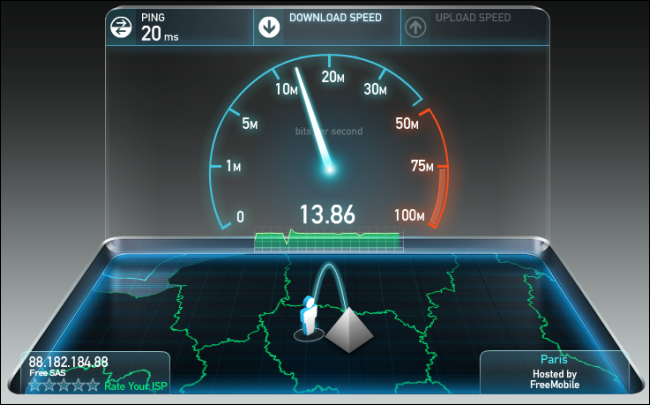 Server-Side Issues: Your download speeds don’t just depend on your Internet service provider’s advertised speeds. They also depend on the speeds of the servers you’re downloading from and the routers in between. For example, if you’re in the US and experience slowness when downloading something from a website in Europe, it may not be your Internet service provider’s fault at all — it may be because the website in Europe has a slow connection or the data is being slowed down at one of the routers in between you and the European servers. Many factors can impact Internet connection speed, and it’s hard to know which is the precise problem. Nevertheless, in real-life usage, you’ll generally experience slower speeds than your Internet service provider advertises — if only because it’s so dependent on other people’s Internet connections. You can attempt to measure your Internet connection speed by usingthe SpeedTest website. Select a nearby server and SpeedTest will establish a connection to it, trying to download the file as fast as it can. It also attempts to upload data, testing your upload speed. This gives you a good idea of the speed your Internet service provider is giving you, as the SpeedTest servers are chosen because they can deliver very fast speeds. Using a nearby server allows you to test a more direct connection, with minimal interference from third-party routers — for example, if you choose a SpeedTest server on the other side of the world, you’ll almost certainly experience slower speeds. Check your connection speeds at different times, including at peak hours and off. They may fluctuate over time. If your connection speeds aren’t as advertised, there’s not much you can do. You may be able to upgrade your router or tweak your router’s settings to minimize Wi-Fi interference, but ISPs probably won’t listen to you if you call and assert that you need to be getting a faster speed. The speed is advertised as “up to” for a reason.